Ferrari are holding off signing a new contract with Kimi Raikkonen, saying the reason is to ensure the Finnish driver stays motivated this season. His deal runs out this year and Ferrari have an option to retain the 35-year-old alongside Sebastian Vettel in 2016. Team boss Maurizio Arrivabene said: "He has demonstrated he's a great driver so if you're asking now if he deserves to renew the option, I'm going to say yes. "But if I'm going to say yes, I don't want a driver to fall asleep." Arrivabene was talking after Raikkonen's best performance so far this season, a second place behind Mercedes' Lewis Hamilton in Bahrain on Sunday. Raikkonen was outperformed comprehensively by then team-mate Fernando Alonso in 2014, but has been much more competitive with Vettel this season following Alonso's move to McLaren. Arrivabene said: "Kimi is giving his best when he's in a bit of trouble. This is the psychological approach. "The paper at the moment is white, OK? Sometimes I have to take the pen and then take it back, and Kimi is going to the podium." Hamilton remains a free agent for 2016, although he continues to insist he will eventually sign a new contract with Mercedes, and that it is being held up only by "details". In a joint BBC interview with Vettel in Bahrain, Hamilton was asked if the two drivers would ever be in the same team. He replied: "Not any time soon." Asked about Hamilton, Arrivabene said: "Did Lewis Hamilton call you? Because he never called me. "Every driver here in the paddock, they want to drive for Ferrari, this is normal. Even guys that were quite a lot of times world champion. "But I'm happy with the drivers we have. This doesn't mean I want to sign tomorrow with Kimi. 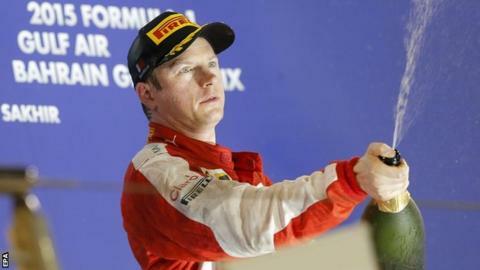 We were very, very clear, I repeat again and again, I said to Kimi 'look, it depends on your performance'." F1 boss Bernie Ecclestone said Hamilton was "happy where he is". Ferrari are in no rush to sign a second driver for 2016, preferring to keep their focus for now on improving the car, after emerging as the second fastest team behind world champions Mercedes this season. Ferrari sources say Arrivabene has been leaning towards keeping Raikkonen since before the start of the season, as he and Vettel have created a harmonious line-up and are working well together. The Italian team approached Williams driver Valtteri Bottas towards the end of last season but have not since pursued their interest in the younger Finn, who is 25. Williams in any case have an option on Bottas for 2016 and are likely to retain him, quite probably with current team-mate Felipe Massa as well.